Scotland-based post-punk new wave band TV21 will shortly be releasing their second album, a mere 28 years after their first one. 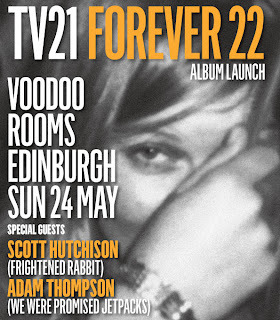 To celebrate, there’s a launch party in the Voodoo Rooms in Edinburgh on the 24th of May. As well as a set from TV21 Scott Hutchison of Frightened Rabbit and Adam Thompson of We Were Promised Jetpacks will be playing acoustic sets. Tickets cost a fiver plus booking fee and you can get them from Tickets Scotland. Sadly there’s next to no chance of me getting to it, it’s on the wrong side of the country for me for one thing, but it looks like a good night. For more info on TV21, the album and the gig you can visit their website or MySpace.